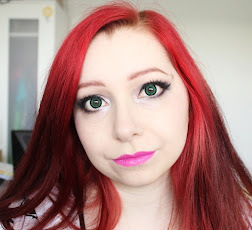 I thought I'd start up a weekly series of makeup posts as I love to experiment with makeup. Every Friday I'll be posting a fantasy makeup design, basically anything that you wouldn't usually wear outside unless it's to a fancy dress party. Today I wanted to start off with a frosty makeup as it's quite cold and I really want it to snow. I didn't really plan out what I was going to do, I just kinda made it up as I went along. I would have liked to put some false eyelashes on but I don't have any blue or white ones at the moment. I think they would have looked quite nice though.